This rugged design offers a variety of protection heads with 1/2" NPT mounting threads and 304SS sheath. Note that the final length dimension is reduced by 1/2" so if used in a thermowell the sensor will not bottom and cause damage to the sensor. 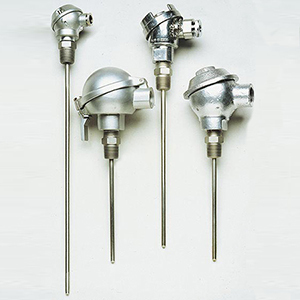 The standard probe uses a Style 2 (3-wire) lead configuration, but other configurations are available. All probes include a screw terminal block for easy connection of copper extension wire. Pricing for several popular models is shown in the ordering table below. Use the Part Number Builder to obtain pricing for other models. For complete product specifications see the Related Links section at the bottom of this page. Fixed length industrial RTD probe with cast iron head, 3 wire configuration, thin film 100 ohm Class B element, 1/4" diameter by 12" long probe, european curve (alpha = .00385). Fixed length industrial RTD probe with aluminum hinged top head, 3 wire configuration, thin film 100 ohm Class B element, 1/4" diameter by 12" long probe, european curve (alpha = .00385). Fixed length industrial RTD probe with sub-mini aluminum head, 3 wire configuration, thin film 100 ohm Class B element, 1/8" diameter by 6" long probe, european curve (alpha = .00385). Fixed length industrial RTD probe with mini aluminum head, 3 wire configuration, thin film 100 ohm Class B element, 1/8" diameter by 6" long probe, european curve (alpha = .00385). Spring loaded RTD probe with cast iron head, 3 wire configuration, thin film 100 ohm Class B element, 1/4" diameter by 12" long probe, european curve (alpha = .00385). Spring loaded RTD probe with aluminum hinged top head, 3 wire configuration, thin film 100 ohm Class B element, 1/4" diameter by 12" long probe, european curve (alpha = .00385). Spring loaded RTD probe with sub-mini aluminum head, 3 wire configuration, thin film 100 ohm Class B element, 1/8" diameter by 6" long probe, european curve (alpha = .00385). Spring loaded RTD probe with mini aluminum head, 3 wire configuration, thin film 100 ohm Class B element, 1/8" diameter by 6" long probe, european curve (alpha = .00385). * When installed in a thermowell, the thread engagement will equal the spring loading compression length. Standard: Specify 1/8, 3/16 or 1/4 for probe diameter in inches. Standard probe lengths are 6, 9, 12, 18, and 24" but other lengths are available, specify length in the model number and price at the next longer standard length. Lengths over 24" can also provided, contact the Sales Department for availability and pricing. Metric: Specify M30 for 3mm, M4.5 for 4.5mm or M60 for 6mm diameter. Standard lengths are 150mm, 225mm, 300mm, 450mm or 600mm but other lengths are available, specify length in model number and price at the next longer standard price. Lengths over 600mm can be provided, contact the Sales Department for availability and pricing. Specify protection head style as follows: 12 = Cast Iron; 14 = Miniature Aluminum; 18 = Hinge Style Aluminum; 19 = Subminiature Aluminum.